This volume on the hiking routes of Northern Norway’s stunning coastline presents nearly a hundred day trips of varying length and difficulty. 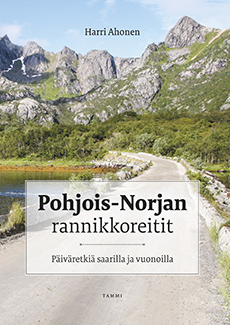 Ahonen’s book neatly combines a hiker’s guide and travel handbook: in addition to the detailed itineraries, there are hints for other sights to see. Accurate maps make it easy to locate the starting points for the chosen routes. The coastline of Northern Norway is a real treasure-trove for the outdoors enthusiast and trekker: fjords, islands, magnificent peaks, and twisty paths, where every corner reveals new vistas. The routes take the hiker along marked paths to secluded sandy beaches facing a glittering turquoise sea, to ancient settlements from the fabled days of the Vikings, idyllic mountain passes and sleepy fishing hamlets, and also to Second World War coastal batteries and reinforced bunkers where time has stood still for seventy years and more. There are plenty of alternative routes on offer, from a few hours’ brisk walk to full-day trekking excursions.